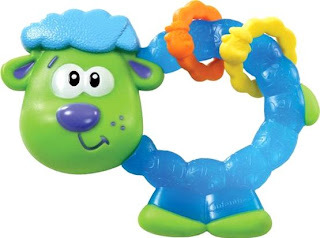 The U.S. Consumer Product Safety Commission, in cooperation with the Infantino, today announced a voluntary recall of about 2,000 Infantino Lamb Grabby Rattles™ because the tail-piece on the rattles can detach, posing a choking hazard to young children. Infantino has received eight reports of the tail piece on the rattle detaching. No injuries have been reported. The recalled Infantino Lamb Grabby Rattles™ are shaped like a lamb with an Infantino elliptical-shaped logo stamped on the front right foot of the lamb. Only rattles with date code 0907 printed on the back of the left ear of the lamb are included in the recall. The production batch code is printed in a dial format with the year in the middle of a circle and an arrow pointing to the number on the circle that indicates the month. Rattles that do not have a date code are not included in the recall. Parents are being asked to contact Infantino toll-free at (888) 808-3111 or visit the firm’s Web site at service.infantino.com for a replacement rattle or a product of equal value.